That might shed some light on the the building. From what I read in the article linked bellow and on the picture i linked bellow it would seem that the sparring Arena has at-least the benefit of giving you a summon able guard that will be able to fight for you. On a 5 minute cool-down. Note that this might be just a side effect of the building and that it is still in an alpha stage. The following bellow might still somewhat apply so did not strike it. If I find more information I will update this post (if i think about it). Would love to see some information data-mined about this. But in shear speculation I think it will be either of 3 scenario's. It either creates a duel area, but most likely spawns a random AI with abilities tailored to a real lifelike player spec and you will have to beat that AI to maybe get a small batch of honor points. (higher level building = more difficult AI?) Other options are possible, though far fetched it could become like a LFD (looking for duel) where you would have to zone you and someone else in and you can duel that person for what ever reward. Though this is very unlikely. Will this be possible to get on a PvE server since you wont see anywhere near as many flagged pvp ppl? Does Ashran count as "outdoor Draenor zone", where you take 50% less damage while below 35% life at level 3? Just a little information, you can't continue your Nemesis quest if you replace it with another building (like I replaced it with a Lumber mill for moar resources). You simply lose the quest. I feel it's my public duty to outline a night of bad drunken choices that will shed some light about this building for all of you discouraged about the Nemesis questlines. So yeah, after a hefty amount of Jameson, I thought it'd be a good idea to replace my lumber mill with a gladiator sanctum. I mean, I like gladiator movies, so why not? Right? I completed the quest leading up to the choosing of an effigy. The troll one enraged me, because we all know what happens when you drink whiskey, right? You want to fight, and you hate trolls by nature. So I talk to the questgiver again, and a little dialog window pops up that asks if I'm sure I want to burn that one, and my memory's a bit hazy, but I remember clicking it with a bit of a "HELL YEAH I DO" attitude. 500 trolls? No big deal. I spent 3 hours and half a fifth in Ashran and collected a whopping 28 kills by joining the community raid. And this is where things start to go downhill. Dumbfounded by how few kills I was getting, I came to 3 alcoholic moments of clarity: 1. 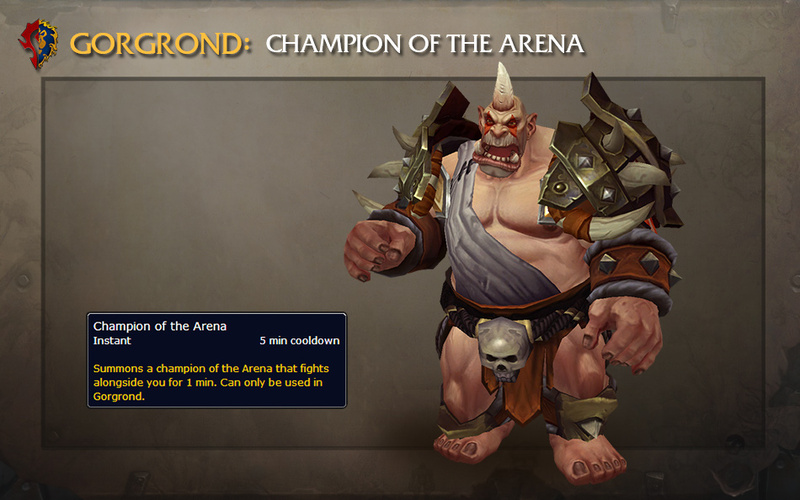 There are an absurdly low number of players who choose troll as a race; 2. Every person that chooses troll as a race also chooses druid as a class, and druids are like cockroaches -- they're unabashedly annoying, and will also survive even an atomic apocalypse; 3. I can probably choose a different, more common and easily-attainable race if I reset the building. So I confidently went back to my garrison and proceeded to build the lumber mill on top of my gladiator sanctum, promptly cancelled it, and started another tier 1 sanctum. 2 hours of build time, 400 resources, and just as much gold later, I was astonished that the questgiver was a jerk and wouldn't let me switch races still. AND it reset my number of kills to 0. Moral of the story: don't drink Irish whiskey and play WoW. Moral of the story #2: it seems impossible to reset the race you want to kill once accepting the quest, so I'd recommend choosing the more common races unless you genuinely possess such a burning hatred that you don't mind completing the quest over a few weeks of Ashran. Godspeed. PvP gear obtained from the Gladiator's Sanctum work orders HAS a chance of being warforged. Just got one today. Cosmetic question: Does the Draenei/Orc standing on a pile of bones automatically come with the Sanctum, or can one prevent that from appearing by avoiding whatever quest involves collecting your enemies' bones? 드레노어의 야외에서 전투 중이 아닐 때 회복 속도를 증가시킵니다. 또한 적 플레이어를 처치하고 부러진 뼈를 모아 정복자의 공물을 얻는 데 사용할 수 있습니다.